Are you a football fan currently in the throes of World Cup fever? If the answer is yes, then perhaps you are asking yourself what different types of food you can prepare to accompany your football evenings. There is a whole host of tips and tricks for this. For example, TV chef Alfons Schuhbeck recently prepared a dish of chicken stew with okra and sweet potato purée in the build-up to Germany’s World Cup Group G outing against Ghana in Brazil. This culinary creation was Schuhbeck’s twist on a popular meal enjoyed by millions in western Africa,. Women’s magazines offer recipes for light bites and snacks as an alternative to crisps, while online portals such as lecker.de tempt fans with football-themed recipes including “Offside Pasta” and “Referee BBQ”. The motto “variety over monotony” is dominant throughout, as there is no universal, all-purpose recipe to satisfy all our various food preferences. However, when it comes to certain fundamental questions, the majority of consumers are in agreement. One such issue that appears to unite the majority of German citizens: they do not like food which has been transported from far away before it arrives at the dinner table. Given the choice, 63% of those surveyed would opt for products from the local area. 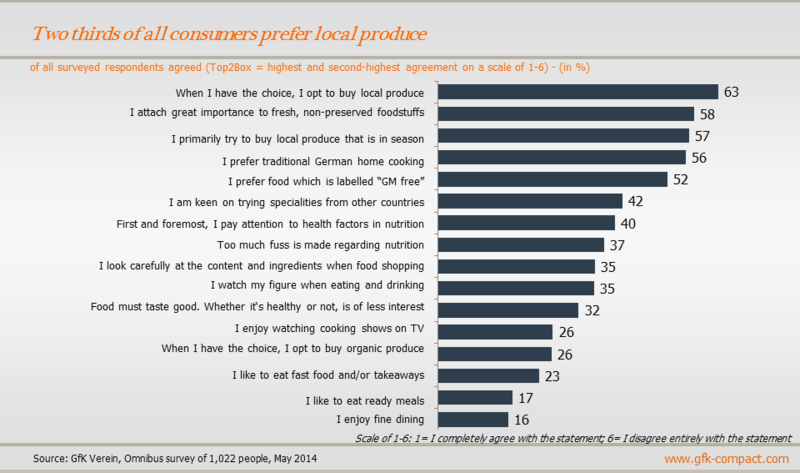 This is one of the current findings of the survey conducted in May by GfK Verein, which asked more than 1,000 people about their attitudes toward food. Nearly 60% of respondents consequently expressed a preference for fresh, seasonal produce. 58% of respondents indicated that they prefer non-preserved foodstuffs such as fresh fruit and vegetables which were in season. Moreover, one in four choose organic produce over foodstuffs which do not carry a corresponding label. More than 50% of consumers are still enthusiastic fans of traditional recipes. 56% of those surveyed indicated that classic home cooked favourites such as schnitzel, stew and fried potatoes are a regular feature at mealtimes. However, genetically modified ingredients are still viewed with suspicion by the majority of Germans. One in two respondents prefer foodstuffs which are clearly labelled as not being subject to this technology. Otherwise, Germans appear to be quite adventurous on occasion when it comes to food and a good 40% said that they enjoy culinary trips and trying out specialities from abroad. Aside from eating for pleasure, healthy eating and wellbeing are an important part of the German attitude towards food. In this context, 40% of those surveyed described themselves as being health-conscious in relation to food. Slightly fewer (35%) admitted to being calorie-conscious when shopping for food or checking the content and ingredients of the food that they buy. Yet not all take this issue so seriously. For instance, 37% explained that they believe too much fuss is made about nutrition, whilst 32% indicated that they were not so concerned by the health benefits of food, as long as it tastes good. 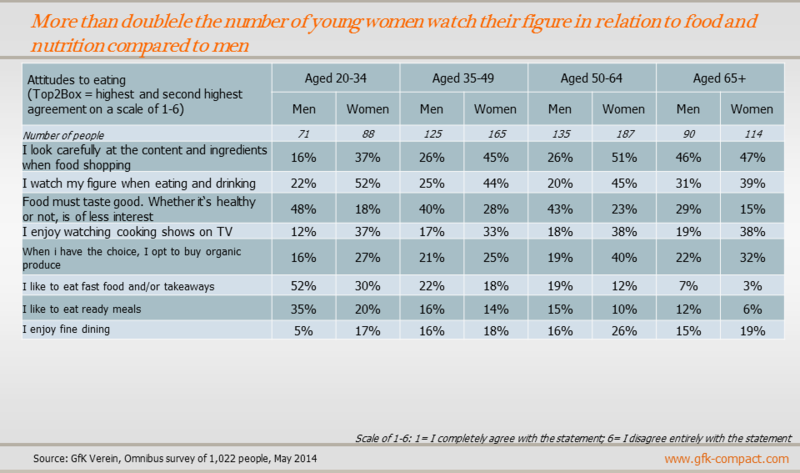 One in four respondents also said they liked watching others prepare meals and enjoyed cookery programmes on TV. If viewers are particularly hungry, they can then either recreate what they’ve just seen, or simply relax and order take-out. When it comes to eating, 23% of Germans are happy to rely on the skills of other people – they simply pick up their phone to order food to be delivered, or walk around the block to the takeaway. In addition, 17% admitted that ready meals feature on their household menus. As the famous old adage states, everyone has different tastes. Age seems to play a particularly significant role in this. 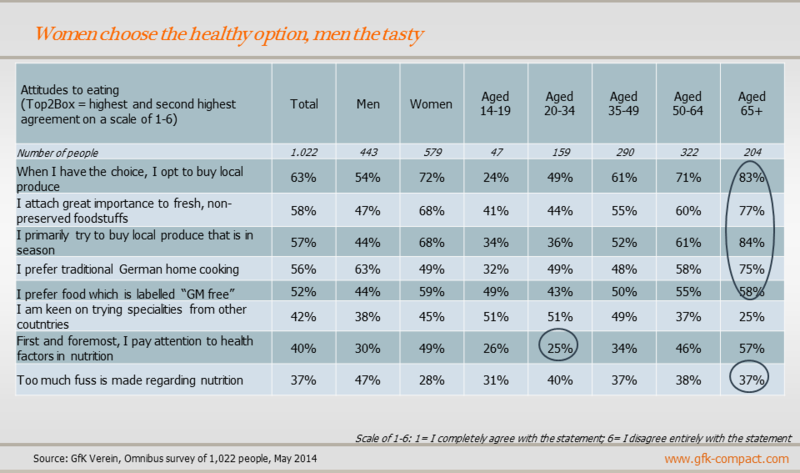 Older people place more value on local, fresh and seasonal produce than younger consumers. It is apparent that senior citizens prefer to return to tried-and-tested, traditional fare when cooking – three quarters expressed their preference for classic home cooking, while an above average proportion choose to eschew exotic specialties from other countries more often. As we grow older, the health factors relating to food become more prominent as the realisation strikes that eating healthily can counteract bodily limitations. 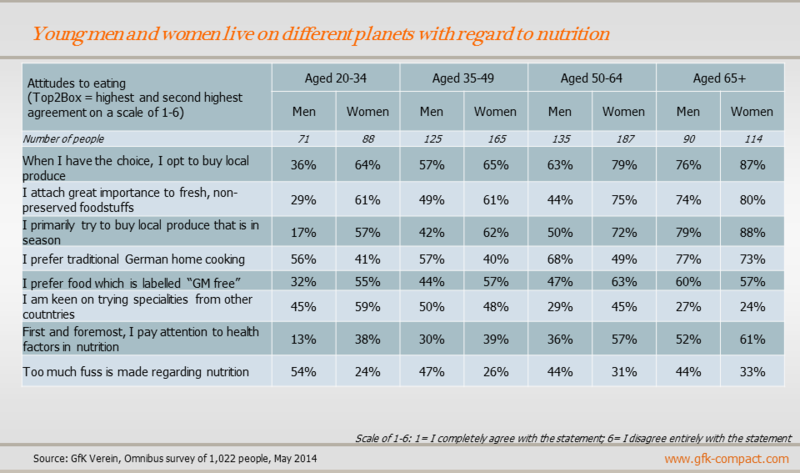 Consequently, an above-average proportion of over 65s pay special attention to health factors in regard to nutrition. As the Ancient Greek physician Hippocrates reportedly said “Let food be thy medicine and medicine be thy food”. The young generation of 20-34 year olds approach the subject of nutrition with a slightly less critical eye. They are less bothered by health aspects and turn correspondingly more regularly than the average German consumer to fast food and ready meals. However, young people are also more willing to experiment, with one in two under 35s expressing a penchant for trying delicacies from around the world. Take a glance into the kitchen at a top restaurant and one thing should immediately strike you; where are the women? More often than not you will see men handling hot pans and stirring sauces. Yet at home, it is more often women who take an interest in food and nutrition, asking questions and displaying a more acute understanding of all things related to food, cooking and healthy eating. Women pay far more attention to contents and ingredients and organic labelling, preferring fresh, seasonal and local produce, and avoiding genetically modified foodstuffs. 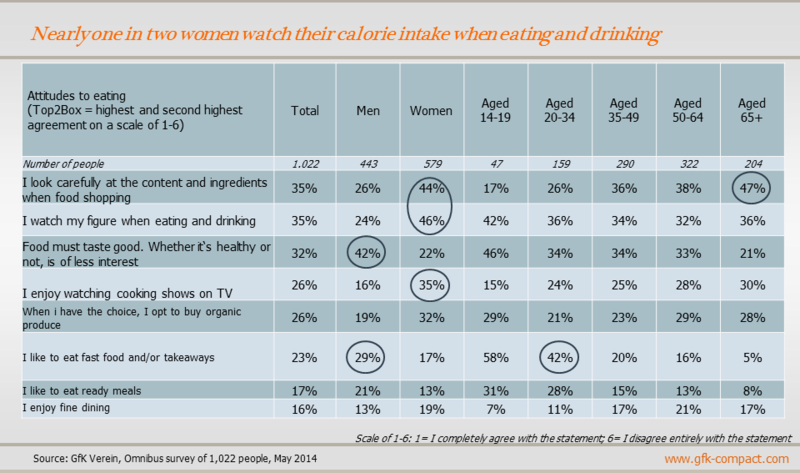 Women also watch more cooking programmes, are more calorie-conscious when eating and drinking and are less likely to buy ready meals or fast food than men, for whom, conversely, taste is king. According to the survey, 42% of men do not consider how healthy a certain food is to be of great importance, as long as it tastes good. In addition, nearly 50% of men believe that too much fuss is made about health benefits linked to food, while the corresponding figure for women is just 25%. Anyone who still believes that gender differences are primarily seen in the older generations has been sadly misled. These days it is young men and women who find themselves poles apart in their attitudes toward nutrition. For instance, young women between the ages of 20 and 34 pay considerably more attention to the freshness of food, preferring seasonal produce from the local area with a low carbon footprint, than their male counterparts. Women are also far more concerned about contents and ingredients in food, with more than twice as many women watching their weight and wishing to eat healthily compared to men. Where young men are concerned, fast food is still immensely popular, with 52% of 20 to 34-year olds expressing a fondness for takeaway food. The corresponding figure for young women is a mere 30%. Instead, young women like preparing their own food, with 37% stating that they enjoy watching cooking shows in which the (mostly male) top chefs prepare dishes. For men this figure stands at just 12%, a far more modest following. As men and women get older, their attitudes towards nutrition converge somewhat, reflected especially well by views on seasonal produce. More than one in two women under the age of 35 prefer to buy fruit and vegetables that are in season, while less than one in five men of the same age group consider this to be an important factor. For the over 65s, the difference between the sexes narrows, resulting in a gap of just nine percentage points. Nearly everything is possible when it comes to food these days. While vegans are preparing strips of tofu and various vegetables for the barbeque, steak aficionados are taking culinary pilgrimages in search of the finest, most tender pieces of meat at the butchers. Numerous amateur cooks take inspiration from the professionals on TV, who may be raving about the advantages of molecular cooking today, yet hail the return of potato soup tomorrow. Those who can’t quite decide whether to go for a hotdog before the next World Cup game or a low-calorie snack of seasonal fruit and vegetables or perhaps just order something from the Thai take-out on the corner, would perhaps do well to recall the words of Immanuel Kant and simply eat what they fancy. After all, as the famous German philosopher said “You can't argue about taste”.